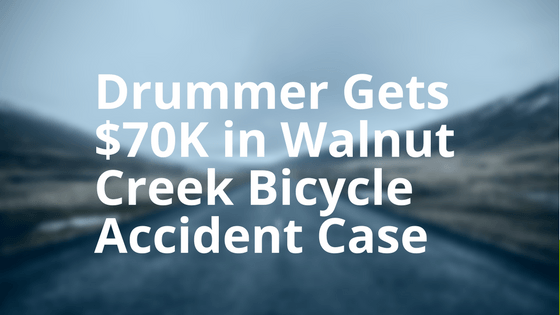 Drummer gets $70k in Walnut Creek Bicycle Accident Case. On a spring evening in Walnut Creek (San Francisco Bay Area) a 28-year old musician and co-founder of the heavy metal band Lyceum was riding his bicycle home from dinner with his parents along the popular Contra Costa Canal Trail. As the bicyclist was riding through the intersection of Bancroft Road and the Contra Costa Canal Trail on a green light, a negligent motorist blew through a red traffic signal on Bancroft Road. The motorist struck the young man on his bicycle, sending him flying into the air and onto the front windshield of his Volkswagen. The force of this impact shattered the glass. The bicyclist rolled from the hood of the vehicle, crashing onto the pavement. When emergency personnel responded to the scene, the bicyclist was experiencing shooting pain to his left collarbone, which was already visibly swollen. The cyclist was transported by ambulance to John Muir Medical Center in Walnut Creek where he was diagnosed with a severely broken collarbone. He was fitted with a sling for his left arm, and he immediately began to assume the worst – that his drumming career was over. Feeling discouraged, the bicyclist began to explore his options. After talking with his friends and family, the bicyclist was referred to bicycle accident attorney, Sally Morin. Once the bicyclist spoke with Sally Morin and her Oakland personal injury lawyer team, he knew it was the right fit – an experienced team, eager to advocate aggressively for their clients. Over the next several months, as the musician was treating for his injuries, Sally’s team collected his medical records and began drafting a bodily injury demand. Upon completion of his treatment, the team quickly finalized the demand, submitted the final product to the personal injury insurance adjuster and started negotiations. Noticing from the get-go that the insurance company was not valuing the bicyclist’s claim appropriately – and they were even trying to place fault on their client - the Sally Morin Personal Injury Lawyers team filed a personal injury lawsuit in the Contra Costa Superior Court. Over the next several months, Sally Morin and her team worked to build up the bicyclist’s case through discovery and deposition testimony. While mediation had been scheduled, Sally Morin contacted the defense counsel one final time, determined to get the case settled without having to incur any additional fees for her client, or delay settlement any longer. As a result of Sally Morin and her team’s persistence, dedication and expertise, the case was settled for $70,700.00, without the need for mediation or trial. The client was very happy to not have to go through more litigation to get his money. To add to this this victory, Sally Morin’s team focused their attention next towards the bicyclist’s Kaiser lien, and securing a reduction. Arguing that the emergency room bill was unreasonable, Sally Morin negotiated down the $36,000 lien to only $18,800 –half of the original amount. Every single dollar knocked off the Kaiser lien went directly into the bicyclist’s pocket, substantially increasing his net amount. In the end, the personal injury team at Sally Morin Personal Injury Lawyers achieved a great settlement for the bicyclist and musician, and provided him with the peace of mind he was seeking for over a year. He is now back to normal life –spending his time in the recording studio, kayaking California rivers and playing hockey with his family and friends. If you or someone you care about has suffered personal injury from a bicycle accident, contact us now for a FREE online case evaluation.